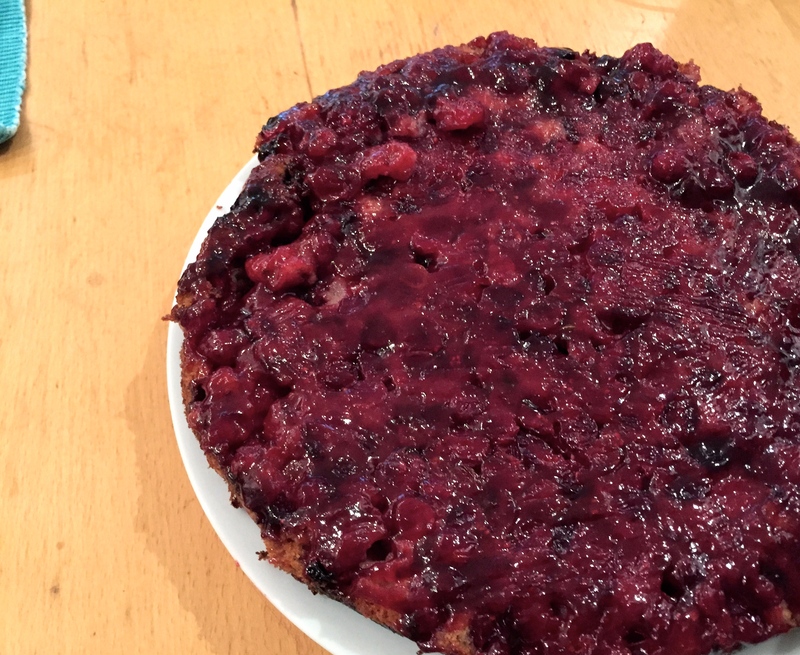 For me, Thanksgiving is not complete without something cranberry-ey, and all the better if cranberries appear in multiple guises: in my family, they usually appear in cranberry sauce, a surprisingly delicious jello “salad,” and this incredible cranberry upside-down cake. Ever since I can remember, my mom has made this cranberry cake for Thanksgiving — and often for Christmas, too, on my request. For me, it is an inseparable part of Thanksgiving and of the wintry holiday season in general. There’s something about that combination of whole cranberries baked into an orangey cake batter and topped with homemade whipped cream that puts a smile on everyone’s face. Thanksgiving is my favorite holiday and it’s one of the things I miss most about not living closer to home. Since Thanksgiving’s not celebrated in the UK, it’s hard to take off that random week in November. Last year, we had a lovely Thanksgiving celebration with Sarah and Joe, but alas they’re back in the US of A now (miss you guys!). F and I were going to try and host our own Thanksgiving this year, but my all-consuming DELTA course and various other scheduling conflicts mean it probably won’t happen. But that doesn’t mean I can’t make some of my favorite Thanksgiving recipes! 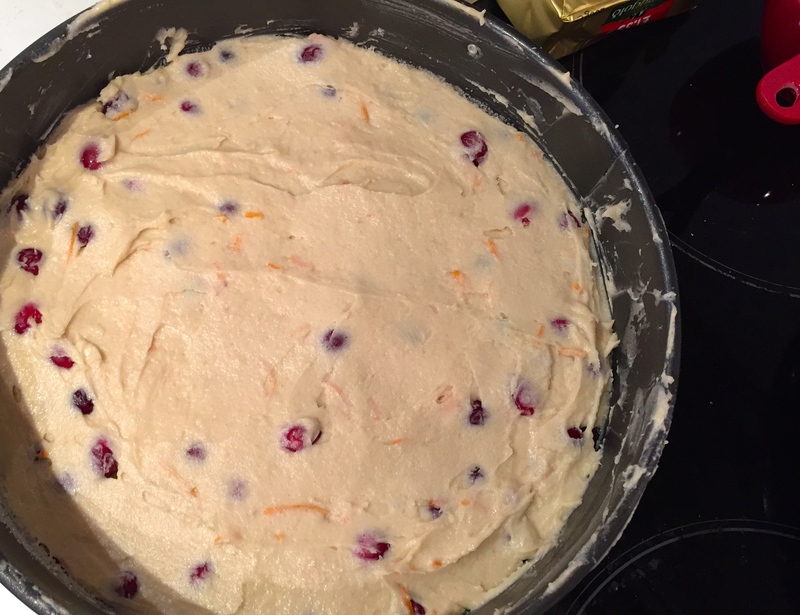 With the holiday coming up on Thursday and the DELTA course starting to taper off (less than 2 weeks & 3 assignments to go…), I decided to spend a rainy Sunday afternoon in the warm kitchen making cranberry cake. The cake is pretty easy to put together: pour some cranberries into a well-buttered cake pan, whip up the thick batter, spread it over the cranberries and bake! With luck, you’ll be able to invert your cake without incident and spread it with some warm jam for a finishing touch. Mine turned out a bit on the rustic side, as I used a springform cake pan which is a little bigger than your standard round cake tin — the cake was thus a bit thinner and stickier. I probably could’ve baked it for a little less time, but it still turned out deliciously and tasted exactly like it should. Go make it and you’ll know what I mean. Butter a round cake pan with the 3 tbsp butter. 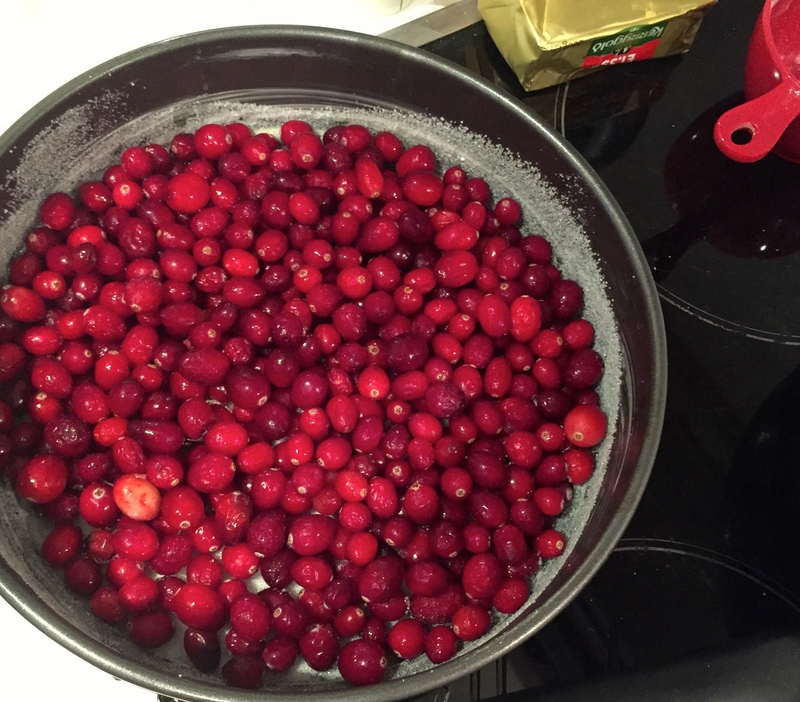 Sprinkle the 1/2 cup of sugar evenly over the butter, and pour in the rinsed and dried cranberries. In a medium bowl, whisk together the flour, baking powder, and salt. In a separate bowl, cream together the butter, sugar, egg, vanilla, and orange until well-combined. Alternate adding the 1/2 cup milk and flour mixture to the butter-egg mixture, beating until well-combined. The batter will be quite thick. Spread the batter over the cranberries, sealing the edges and smoothing the top. Bake for 1 hour, until the top is well-browned. Let cool for 20 minutes, then run a knife around the edge of the cake and invert onto a platter. Heat the jam (if using) in a saucepan, then brush it over the top of the cake. Top with homemade whipped cream, if desired (plain yogurt is also nice, for the more health-conscious out there), and enjoy warm or at room temperature. This entry was posted in celebrations/holidays, family, food, pictures, recipes and tagged cake, Christmas, cranberries, dessert, Thanksgiving on 23.11.2014 by taplatt. Update, 1 Oct 2017: I’ve made this cake repeatedly over the past few years, and it has gotten rave reviews from colleagues, friends, and fellow runners. I’ll definitely keep it in my rotation. Preheat the oven to 175C (350F) and grease a springform cake pan. In a large bowl, cream the butter, sugar, and vanilla with an electric mixer. Add the eggs one at a time, beating after each addition. In a separate bowl, whisk together the almonds, baking powder, ground cardamom, and salt. Fold the dry into the wet ingredients and stir until combined. Spread the batter (it will be quite thick) into the cake pan and bake for 30-40 minutes, until golden brown and an inserted knife comes out clean. Let cool and, if you want, sprinkle powdered sugar (icing sugar) over the top. This entry was posted in celebrations/holidays, culture, food, pictures, recipes and tagged almond cake, birthday, cake, dessert, ground almonds, Norway, Scandinavia on 12.07.2014 by taplatt. Emma was in London this week and, knowing she is a tea-and-scone lover like me, I made a reservation for us to have afternoon tea at Tea & Tattle in Bloomsbury, right across from the British Museum (which a friend of mine has brilliantly re-named the “Spoils of Empire Museum”). The experience at Tea & Tattle was delightful. The bright basement tearoom is cozy yet uncluttered, with funky paintings on the walls. We got a great deal on “Traditional Tea for Two”, which allowed each of us to choose one sandwich, one tea, a jam flavor for the scones, and one cake. They even threw in a refreshing, unsweetened lemonade for free. We both had the “smoked salmon, creme fraiche with cucumber and lemon” sandwich — you can choose from four kinds of bread and yes, they will appear crustless and cut into triangles. Cute. Next came the scones, halved and spread with clotted cream and jam. We each got a different jam so we could share: the raspberry and vanilla jam was lovely, and the damson (plum) jam had pleasing spiced notes. On the cake front, I had a moist and nutty carrot cake and Emma had a pretty Victoria sponge — top marks for both. Funnily enough, we both thought that the tea itself was the most disappointing part of the experience: my Earl Grey was too weak and Emma’s English Breakfast was too strong. But the service and pace more than made up for it. We told them all our choices at the beginning, and then they brought each “course” as we finished the one before. We did not feel rushed and lingered chatting long after we’d finished our cake, never feeling like they wanted to get rid of us. The amount of food was also perfect — I didn’t leave feeling overstuffed or still hungry. Overall, I’d definitely recommend popping into Tea & Tattle, whether it’s for a full afternoon tea or just for tea and a scone. It’s a great place to escape the bustle of London and catch up with a friend who you haven’t seen in a while. Complete the afternoon by strolling through the Spoils of Empire British Museum afterwards. This entry was posted in culture, food, full meals, pictures and tagged afternoon tea, Bloomsbury, British Museum, cake, carrot cake, scones, tea, Tea & Tattle on 08.07.2014 by taplatt. Let me just say that the Germans know how to do cake. They unapologetically make moist, delicious creations and don’t shy away from using lots of butter and sugar. Once in a while, I am totally okay with that. F had been telling me about his Rhabarbarkuchen (rhubarb cake) for ages; finally, in the height of the season a month or so ago, we bought some rhubarb, stocked up on Quark, and spent an evening making the cake. Ohmygoodness is this a good cake (see first two sentences, above). A moist and flavorful revelation in my mouth. There’s a cake layer, a pudding-like layer (that’s the Quarkcreme part), lots of rhubarb, and a sweet-buttery-crunchy streusel topping. Just wow. This cake is totally worth the effort it takes to whip up three different layers. Be patient while it bakes and you’ll be rewarded. It’s great as an afternoon snack with coffee or tea and is also totally okay to eat for breakfast or brunch — just add a dollop of yogurt. Wash and cut the rhubarb into 2cm/1in chunks. Set aside. Make the Quarkcreme: Put all the necessary ingredients (see above) in a large bowl and whisk or beat with an electric mixer to combine. Make the streusel: In a medium bowl, whisk the flour and sugar together. Work in the butter with your hands or a pastry cutter, until everything is well-combined and only a little crumbly. Make the cake batter: In a large bowl, whisk the baking powder and flour together. Add the sugar and butter and beat with an electric mixer until evenly distributed. Add the eggs one at a time, beating after each addition. The batter will be thick and almost more like dough. Assemble cake: Press the batter/dough into the bottom of a large sheet pan. Spread the Quarkcreme evenly on top. Distribute the rhubarb pieces evenly over the top, then sprinkle the streusel over everything. Bake the cake for 45-55 minutes or until the streusel turns golden and the Quarkcreme seems set (you may have to cover it with foil partway through). Let cool for an hour or two before serving. This entry was posted in culture, food, pictures, recipes and tagged cake, German, Germany, Kuchen, Quark, Quarkcreme, Rhabarberkuchen, rhubarb, rhubarb cake on 24.06.2014 by taplatt. Yes, I’m behind on the Valentine’s Day dessert bandwagon. But F and I are neutral on the holiday — why do you have to wait for a special day to celebrate each other and those you love? So I didn’t actually make this cake because it was Valentine’s weekend. 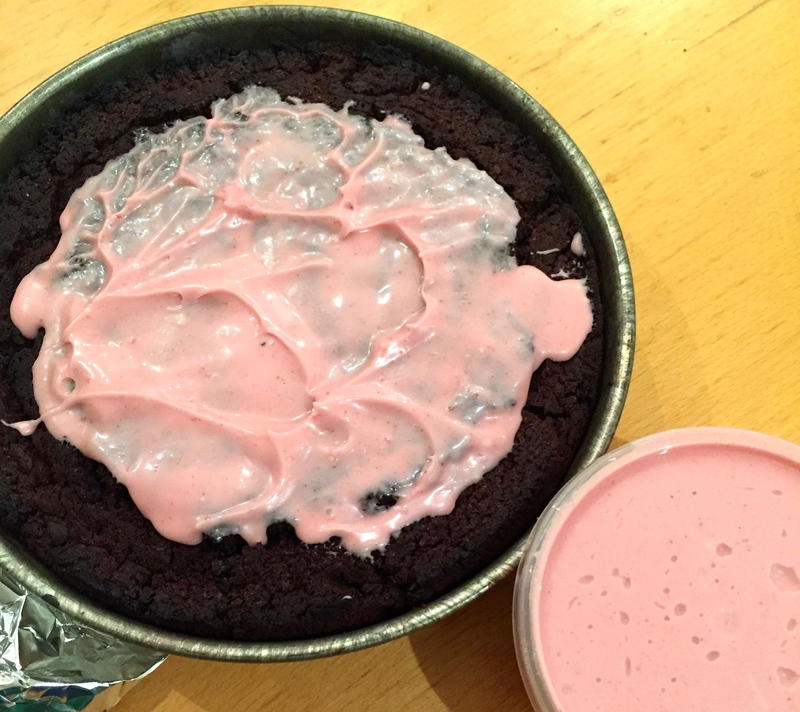 But Sarah had given me extra beets that she wasn’t going to use before traveling, which made this a great opportunity to try her recipe for chocolate beet cake (originally from BBC Good Food). Plus, S & I were coming for dinner, and it’s always better to have more people to help devour dangerously delicious baked goods! You might be thinking, “Beets? In cake?” I was skeptical, too, but Sarah assured me that you don’t taste the beets at all, and she was right. They add sweetness and keep the cake moist (and help you pretend it’s sort of healthy). S & I seemed to enjoy it, and F gave it an “amazing!” rating. This cake is so chocolatey and delicious. I used a little less sugar than Sarah’s recipe called for and it didn’t seem to make a difference. I’d recommend erring towards the shorter cooking time, as the cake may get dry if you leave it in for the full time. The pink cream cheese frosting, from Joy the Baker, is completely optional but if you choose to go for it you won’t be disappointed. Preheat the oven to 170C (fan). Put the beets in a food processor and blend until they’re finely chopped. In a large bowl, whisk together the dry ingredients. Add the chopped beets, eggs, and vanilla to the dry ingredients and whisk to break up the eggs. Pour in the sunflower oil and stir vigorously until fully mixed. The batter will be thick and fudgy. While the cake is cooling, make frosting (optional): put cream cheese in a medium bowl and beat with an electric mixer for 30 seconds or until soft and smooth. Add the butter and beat for 30 seconds or until well combined. Add the beets and beat for another few seconds. Pour in the powdered sugar, vanilla, milk, lemon juice, and salt, then beat on medium until the frosting is smooth. Let the frosting chill for at least 30 minutes in the fridge before frosting the cake. This entry was posted in celebrations/holidays, community, food, pictures, recipes and tagged BBC Good Food, beets, cake, chocolate, cream cheese frosting, Joy the Baker, Valentine's Day on 17.02.2014 by taplatt. This spiced pear coffee cake, adapted from Joy the Baker’s “pear crumble coffee cake” (I opted for no “crumble”) is similar to the moist apple spice loaf I made last year in its spice profile and fruit chunks. It is almost healthy enough to eat for breakfast, and it’s certainly good enough for an afternoon snack with a mug of tea. Cinnamon, ginger, and nutmeg lend earthy, autumnal flavors to a spongy cake speckled with lots of pear chunks. Despite the denseness of the batter, the cake turns out surprisingly light and springy. The just softened pears impart a delightful, nutty flavor. (Speaking of nuts, I might add some next time, for texture.) 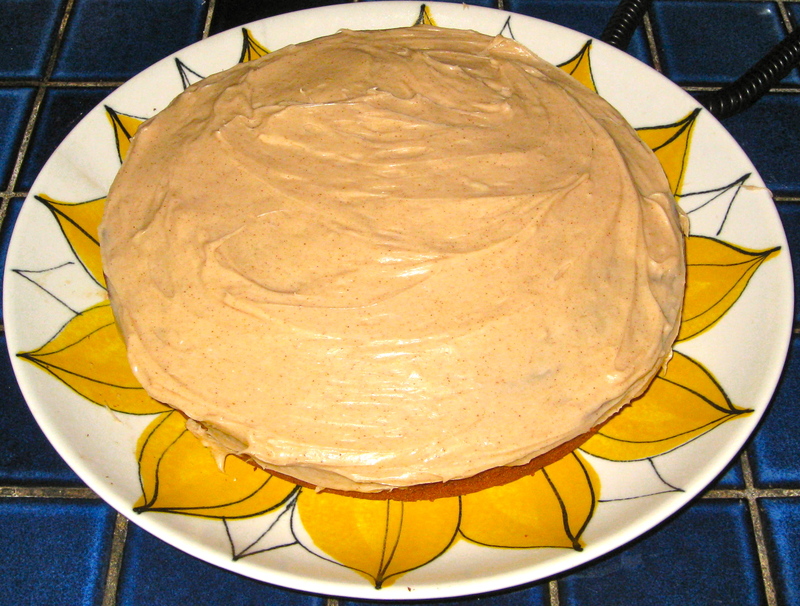 The cake has a slightly crunchy, golden-brown top. Preheat the oven to 350F (175C) and grease a square baking pan. In a medium bowl, whisk together the dry ingredients (through nutmeg). Stir in the sugars. In a separate bowl, whisk together the butter, eggs, buttermilk, and vanilla. Add to the dry mixture and stir until combined — the batter will be quite thick. Gently fold the pears into the batter, scrape everything into the baking pan. Bake for 30-40 minutes or until an inserted knife comes out clean. Let cool for 20-30 minutes before serving. This entry was posted in food, pictures, recipes and tagged brunch, cake on 30.11.2013 by taplatt. This Käsekuchen — cheesecake, German-style — is one of F’s specialties, but he hadn’t made it for me until now. It was absolutely worth the wait. The recent acquisition of a food scale and a springform cake pan made this recipe possible — in fact, we sort of splurged on these tools in order to make the cheesecake, because the recipe F uses has grams rather than cups. This is no American-style cheesecake. The only cheese in it is quark, a tangy, very low-fat fresh cheese common in Germany. It tastes a bit like yogurt, but has a thicker, spreadable consistency and is technically cheese. Instant pudding — we had to use custard, since we couldn’t find pudding here — acts as a thickening agent for the filling. The combination of quark and pudding/custard lends a pleasant tang to the final product, and it’s not too sweet. Another difference between Käsekuchen and American-style cheesecake is the crust: in the States, cheesecake crust is usually some kind of crushed graham cracker or cookie deal; Käsekuchen requires a proper dough that tastes almost like a sugar cookie. Delicious. Nutritionally, you could do much worse than Käsekuchen. Yes, there’s some sugar and butter, but the quark is virtually fat-free and we used mostly semi-skimmed milk. This is totally healthy enough to eat for breakfast. Make the crust: Put all the crust ingredients in a large bowl and blend with an electric mixer until the butter forms small balls. Use your hands to finish forming the mixture into dough. Roll the dough out on a floured surface, then press it into the bottom and sides of a springform cake pan. Preheat the oven to 175C (350F). Make the filling: Combine all the filling ingredients in a large bowl and blend with an electric mixer until smooth. Pour the filling into the cake pan with the crust. Carefully slide the cake into the oven and bake for 75-90 minutes or until the top is starting to brown and the middle is mostly set — you may have to cover it about halfway through so the top doesn’t burn. Let cool for at least two hours and preferably in the fridge overnight. This entry was posted in culture, food, pictures, recipes and tagged breakfast, cake, cheesecake, German, Käsekuchen, Kuchen, Quark on 24.09.2013 by taplatt. I wanted to make the olive oil ricotta cake from the smitten kitchen cookbook, but the supermarket had no ricotta. However, I remembered reading in Deb’s introduction to the cake that it was a variation on a yogurt cake. So I thought, why not just use yogurt? I did, and it worked! This isn’t too unhealthy as far as cakes go: yogurt and olive oil’s health benefits balance out the sugar and white flour, in my opinion, and this cake takes less than 10 minutes to whisk together and get in the oven. This is a really nice cake with a light texture and subtle, lemony flavor. It stays moist from the yogurt. It’s good plain or doused with rhubarb compote. Just really really nice. Preheat the oven to 350F (175C – no fan). Oil or butter a cake or loaf pan. In a large bowl, whisk together the yogurt, olive oil, sugar, and lemon zest. Add the eggs one at a time, whisking after each addition. In a separate bowl, whisk together the flour, baking powder, baking soda, and salt together. Add to the wet mixture and stir until just combined. Pour the batter into the pan and bake for about 40 minutes, until the top is golden and a knife inserted comes out clean. When the cake is finished, let it cool for 10 minutes before removing it from the pan and/or serving. This entry was posted in food, health, pictures, recipes and tagged breakfast, brunch, cake on 03.05.2013 by taplatt. I’d never made carrot cake before today. Growing up, my non-chocolate-loving dad sometimes requested carrot cake for his birthday, but we never made it from scratch. With a former professor coming over for Sunday dinner, I wanted to make a special dessert. I’d recently seen this carrot cake recipe on The Kitchn so decided to go for it. I mean, who can resist cream cheese frosting? The cake takes some coordination (and lots of bowls) to put together, but nothing requires special techniques; it’s pretty much a whisk-and-combine recipe. And it turned out awesomely. It received positive reviews from F and C, and I was really happy with how moist it remained (I’ve been struggling with our oven temperatures and timing). I realized when we started eating it that I could have — should have — added some raisins for extra juice, but even without the raisins the cake had plenty of flavor and added texture from the walnuts. It’s not the kind of thing you’d want to eat regularly — the frosting is quite sweet — but ‘ll definitely make it again for a special occasion. UPDATE, 30 Sep 2013: Made this again, but adjusted some measurements: I used 1/2 cup whole wheat flour and 1.5 cups white flour, and 1/3 cup of each sugar (cutting down by a little). The cake still came out moist and just sweet enough. Make the cake: Preheat the oven to 350F (175C). In one bowl, whisk together the dry ingredients (through salt). In a separate, smaller bowl, whisk together the eggs and vanilla. In a large bowl, beat the sugar and oil, then gradually alternate adding the dry ingredients and egg mixture, stirring until combined. Grate the carrots and fold them into the batter. Spread it in a pan and bake for 25-40 minutes, or until a knife inserted comes out mostly clean. While the cake is in the oven, make the frosting: Beat the butter and cream cheese with an electric mixer until smooth. Beat in the vanilla and add the powdered sugar gradually, beating and adding until the frosting is at your desired thickness. When the cake is baked, let it cool to room temperature before frosting. This entry was posted in celebrations/holidays, family, food, pictures, recipes and tagged cake on 24.02.2013 by taplatt. In conversation with F the other night, we started talking about the best food/taste combinations. Peanut butter and chocolate is one of my all-time favorite combos (F prefers herb salt and hard-boiled eggs…can you tell who has the sweet tooth here? ), and one with which F is (I should say “was”) not familiar. So I promised that I’d make him something chocolatey and peanut buttery. After combing through bookmarked recipes and various search engines, I remembered that Robin, a fellow Ukraine (R)PCV, used to make an amazing chocolate cake for our Oblast’ Collaborative meetings. 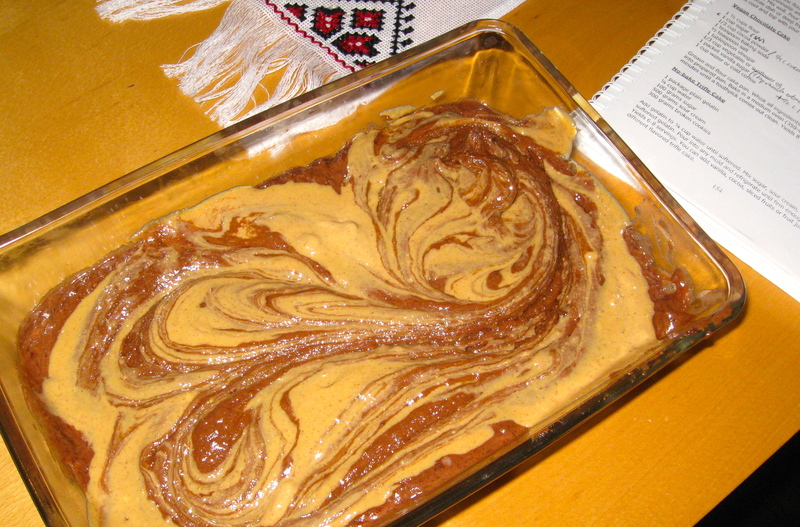 I also stumbled upon Kristen’s (another Ukraine PCV) blog posting of the same recipe — which originally comes from “Babushka’s Kitchen,” the Peace Corps Ukraine Cookbook compiled by PCVs over the years and passed out to each new group of PCVs. Kristen’s version of this cake had just what I was looking for: a peanut butter swirl addition. I changed up the chocolate balance and cut down a little of the sugar for my version. Turns out, F loves chocolate cake! He seemed to thoroughly enjoy this peanut-buttered version. It was a tad dry for me but F thought it was plenty moist. Next time I’ll bake it for less time and maybe try using buttermilk instead of water. Preheat the oven to 375F/190-200C. Grease a baking pan. Whisk the dry ingredients together, then add in the wet ingredients (NOT the peanut butter); don’t forget to melt the chocolate first! Spread the batter into the pan and swirl in melted peanut butter. Bake for 35-45′. This entry was posted in community, food, Peace Corps, pictures, recipes and tagged cake on 20.01.2013 by taplatt. My first documented recipe from back in the States had to be something baked in an oven, since I’ve lived without an oven for over two years. Going to a family friend’s house for dinner was a great excuse for me to try out this applesauce cake, which I adapted from smitten kitchen. The cake turned out quite well — the flavor is excellent and it got positive reviews from various family and friends. Be careful not to over-mix the batter, however, as it can cause the cake to be somewhat chewy. Preheat oven to 350F. Butter an 8-9″ cake pan of your shape preference. Cake: Whisk together dry ingredients. In a separate bowl, beat butter, brown sugar, and vanilla with an electric mixer on high speed until the mixture is fluffy. Add eggs one at a time, beating well after each one is added. Beat in applesauce. Gradually pour in flour mixture with the mixer on low speed, and beat until it is just combined. Stir in walnuts. Spread the batter in the pan and bake it for 35-40′ or until it is golden-brown and a knife inserted into the center comes out clean. Cool the cake for 15′ in the pan, then run a knife around the edge and invert it onto a plate. Flip the cake onto a rack and let it cool completely. Frosting (make while the cake is baking): Beat cream cheese, butter, and vanilla with a mixer on high until the mixture is fluffy. Whisk together confectioners sugar and cinnamon, then add it to the cream cheese mixture and beat on medium until a smooth frosting forms. Spread frosting on top of the cooled cake, and enjoy! This entry was posted in family, food, pictures, recipes and tagged cake on 19.11.2012 by taplatt.